We’re always amused by the marketing content created by phone makers, especially when it comes from Chinese manufacturers. On the web page promoting the Blackview BV6800 Pro, you’ll find graphics partially sourced from the 2014 movie, Fury, with a surly Brad Pitt surrounded by tanks and explosions. We are not sure the company has the rights to use the actor, or how this relates to phone technology – given the truly abysmal 4G reception in the Ardennes forests of Wallonia in late 1944 and early 1945 – but that’s how marketing imagined this handset. The phone, in comparison, is much less Hollywood, and that’s mostly a good thing. Looking at the specification of the BV6800 Pro on paper, it seems like a bargain for the $219 (around £170) that you can buy this handset for online. The phone is generally available in both Europe and the US, although it is worth noting that there are specific models for each of these regions. In the world of consumer electronics, success can be measured by the volume of shipped product, and for Blackview the gold standard was set by a rugged design launched in 2016: the BV6000. The manufacturer shipped millions of those, and like any successful movie, this has naturally led to a sequel – the new BV6800 Pro. Two years is a Pliocene period in smartphone timescales, and therefore the new design is a major revamp over the old BV6000, with almost every aspect having been enhanced or tweaked. The most obvious of these changes is that the BV6000 had a 4.7-inch 1080p display, whereas the BV6800 Pro is a whole inch bigger and has a 2,160 x 1,080 resolution (FHD+) screen. That change elevates this phone into more a phablet, although Blackview didn’t include a stylus or any of the other classic phablet accessories here. Internally the BV6800 Pro packs 4GB of RAM, 64GB of flash storage, an octa-core MediaTek MT6750T processor and ARM Mali-T860MP2 GPU. This is the same hardware that a wide number of low-priced phones have used including the Asus ZenFone Max Plus, Sharp B10, Doogee S55, Cubot P20 and ZTE Blade A610 Plus. 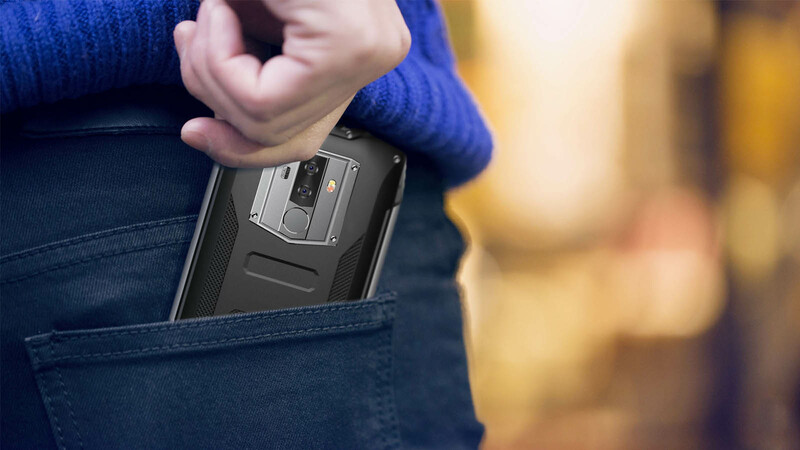 All this hardware, plus the sensors and a 6580 mAh battery, are enclosed in a reasonably thin (14.8mm) polycarbonate case that has soft rubberized corners and aluminum sides. Most of the case is black and depending on your preference at purchase it can have either yellow or green highlights. The fingerprint reader is on the back just below the rear cameras. On the right side is a power button and volume rocker, and the left side sports the SIM card access, and an extra button that we assumed was for the camera. There are two versions of this device, one for global consumption and another tweaked for the EU market. They contain almost identical hardware apart from the bands covered – the frequency ranges for 3G and LTE are slightly different. Included with the handset are some conventional 3.5mm jack headphones and the adapter for them to use the USB Type-C port, along with a power supply and Type-C cable, and an adapter that allows you to use the older microUSB B charging. However, you don’t need to plug anything in to charge the BV6800 Pro if you have wireless charging, as the phone supports that too. As we’ve already mentioned a good number of features, let’s talk more about what the BV6800 Pro has that’s a bit different, and also those things that were left out. It might be standard for Chinese phones, but most European-targeted phones don’t have dual SIM capability like the BV6800 Pro. If you use a microSD card to expand the storage by up to 128GB, then you sacrifice one of the two Nano SIM slots. The sensor selection includes the following: a fingerprint sensor, proximity sensor, and ambient light sensor, along with an accelerometer, compass and gyroscope. 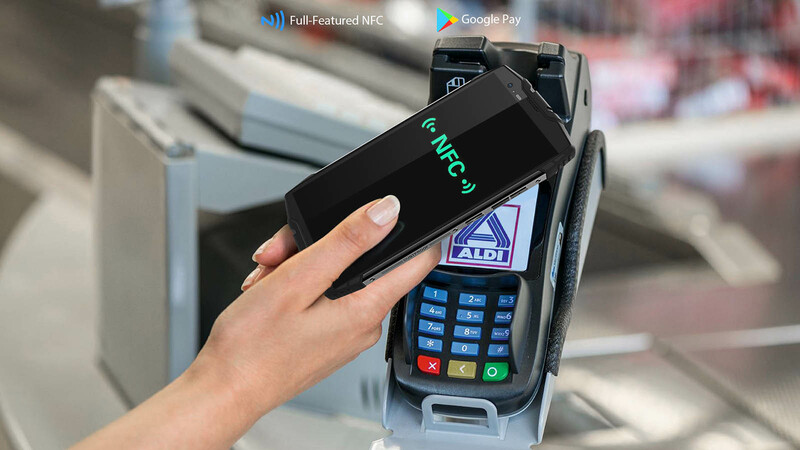 The handset doesn’t have a barometric sensor or a Coulometer, but the NFC capability has been enhanced to include the Chinese enhanced version, Hotknot. We mentioned the extra button previously, and digging into the settings, we discovered that this is a ‘multifunction button’ that can be programmed to perform a selection of actions. Short, long or double clicks can each do something different, although the action choices are rather limited. And, while you can launch the photo app with this, oddly you can’t assign the function of taking a photo to the button. Given that initiating a sound recording is one of the choices, why isn’t snapping a photo? But all of these considerations are peripheral to the real reason you might consider buying this phone, and that’s to withstand the abuse you might carelessly subject it to. 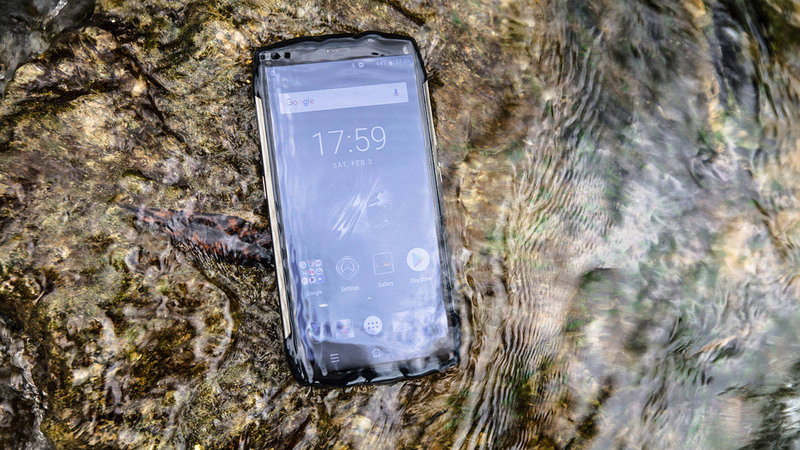 The BV6800 Pro is yet another phone that is sold as waterproof, as defined by the IP68 certification. To be clear, IP68 doesn’t mean a phone is 100% waterproof or dust protected, but the device should be able to withstand total immersion in water at a depth of 1.5m for 30 minutes. The depth is critical, because beyond 1.5m deep, water will get into the phone much more rapidly, and as the handset doesn’t float, that’s guaranteed if it ends up in water deeper than 1.5m. 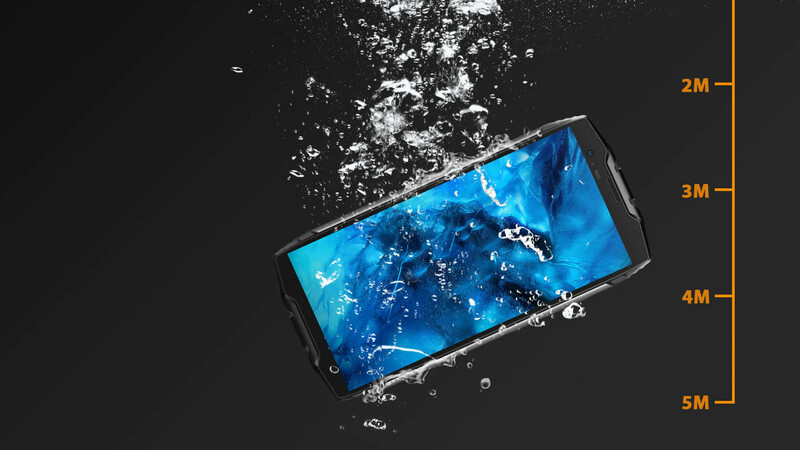 In the promotional material, it is claimed that the phone can go well beyond these tests, handling an impressive 5m submersion for an hour – and it can also cope with a drop from 3m. We take the view that all IP68 certification does is remove the paranoia associated with taking a phone to the beach, or somewhere where it might reasonably get splashed. It isn’t meant to handle much more than that, and it isn’t a point of failure that you need to explore. We should point out that, despite it being repeated many times elsewhere, the US military doesn’t offer a certification service for phone makers, and therefore having passed some of the tests outlined in the MIL-STD-810 document isn’t ‘certification’ or anything remotely close to that. The current trend with cameras is to use two sensors on the rear to get better low light snaps by effectively doubling the amount of data collected. The BV6800 Pro uses dual Sony IMX298 16MP rear cameras with flash, and there is also an 8MP front camera. This sensor was often used in Chinese flagship designs in 2017, like the Huawei Mate 8 and Xiaomi Mi5, and is generally well-regarded. 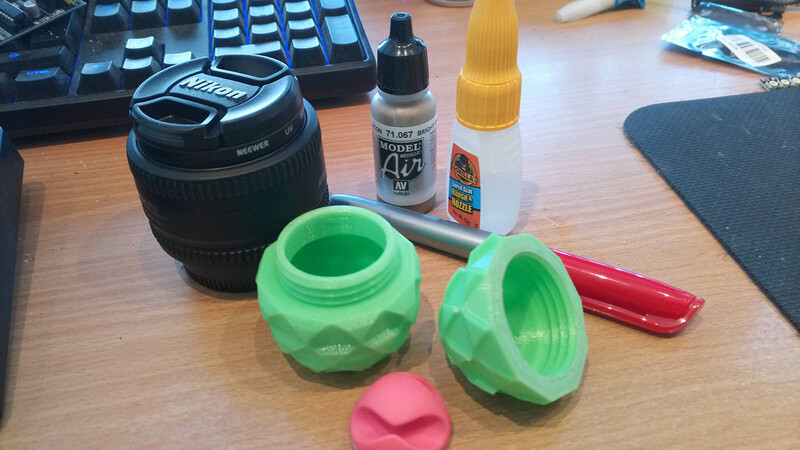 In our tests, it produced balanced and sharp images (see the above and below photos), and the focus is reasonably rapid. As part of the camera experience, Blackview has tailored the camera app to include lots of enhanced modes and manual exposure controls for those who like these. It can even take pictures and video underwater, should you be keen to find out just how waterproof the phone truly is. 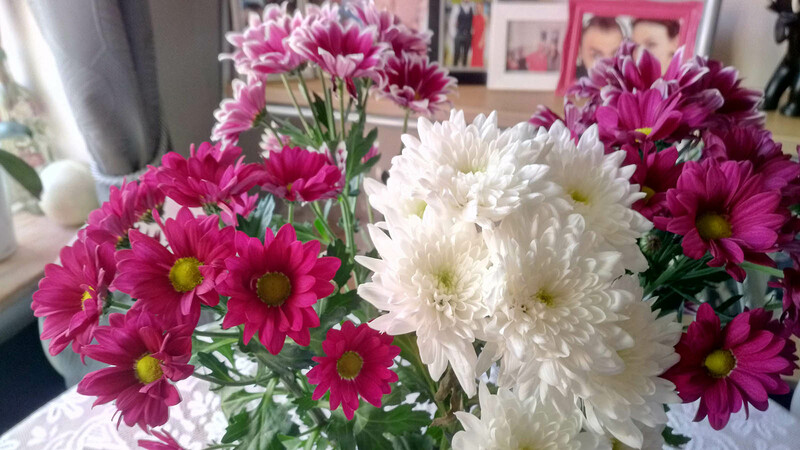 Overall, the camera is one of the best things about this handset, even if it doesn’t come up to the level of those on the latest high-end devices. No phone is perfect, and we did find a few oddities that are worth mentioning to any prospective purchaser. These mostly pertain to the Android OS that Blackview created for the BV6800 Pro, using the Oreo 8.0 release. Why it isn’t version 8.1 seems odd, and it hasn’t had any security updates since August, which is also concerning. The latest kernel is dated September. While testing the phone we used it with a mobile SIM for a while and discovered that without the time provided by the phone service, the BV6800 Pro reverts to GMT+8, which we presume is the time zone where it was created. The settings offer the ability to source the correct time zone using location checking, but it doesn’t work on this device. We also discovered that setting the alarm doesn’t necessarily work when it enters sleep mode, and the alarm doesn’t initiate. We suspect that the Android implementation needs some extra work, and hopefully, it will get that soon, along with more recent security patches. We also noticed that the gizmo mentioned in the instructions which is like a guitar pick, and is used to prise open the SIM tray, was missing, and from what we’ve seen online it is missing from most phones. Broken fingernails are a distinct risk unless you have a plectrum handy. The performance of the BV6800 is fine, although it isn’t the quickest device we’ve tested when compared with the latest Samsung products, for example. What this mostly comes down to is that most of the hardware in this phone was designed in 2016 and used in 2017 products – and the cheaper ones at that. Central to this discussion are the MediaTek MT6750T processor and ARM Mali-T860MP2 GPU, which have both been widely used at the budget end of the market. The MediaTek MT6750T, in particular, doesn’t compare well with Samsung octa-cored ARM processors, as it uses a slightly odd combination of four 1.5GHz ARM-A53 cores and another four that are limited to a 1GHz clock. The logic here is that depending on the circumstances, power can be conserved by better matching the cores to the running tasks. Mostly this concept works well enough, although it is much less impressive when the CPU is confronted with a task that is either a single thread or needs to use all eight cores. This caveat was evident when we tested the phone using Geekbench 4, as it returned disappointing scores of 658 on the single-core test, 2,661 multi-core and 1,877 on the Compute test. To put that in perspective, the LG Nexus 5 managed 859 on the single-core test back in 2013. And the BV6800’s multi-core result is equivalent to a OnePlus 2 from 2015. The battery life, unfortunately, isn’t going to save the day. A score of 3,405 with a battery that is supposedly 6580mAh isn’t great – particularly as the manufacturer made a big song and dance about how this was much more than the BV6000 that the BV6800 Pro replaced. The result is about the same as a Samsung Galaxy S8, which only has a 3000mAh battery. It would be best to categorize this phone as nothing special performance-wise, although depending on what you are using it for this might not matter. However, for a phone meant to be used by those out in the countryside, the fact that the battery life isn’t better, for whatever reason, undermines the device somewhat. The price and performance of the BV6800 Pro makes for a decent combination even if it isn’t as polished or as sweeping an experience as a big-name branded device might offer. At this price point, it was never going to challenge flagship designs, but this handset could be useful for someone going on an adventure holiday who doesn’t want to take their branded phone.